I.D.Eco is the first technology to enable school administrators, law enforcement and public safety officials to proactively monitor and address potential threats before they become acts of violence. 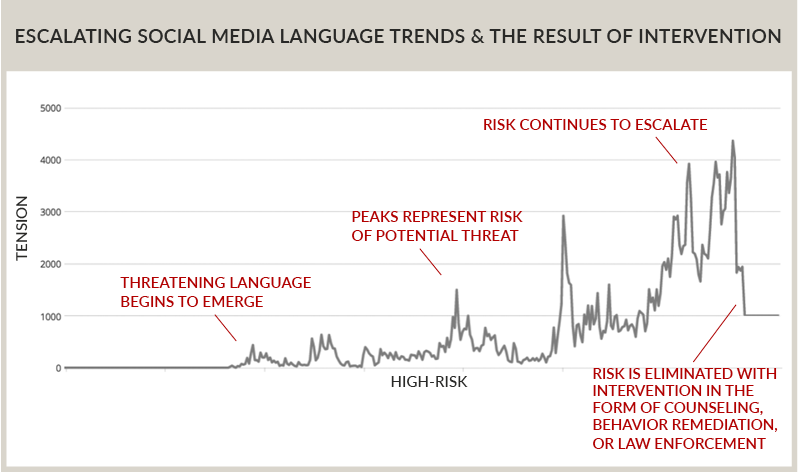 The solution leverages proven marketing technology to interpret the underlying intent of social media posts—from a collective rather than individual perspective—and provides a window into understanding and predicting threatening behavior. I.D.Eco helps prevents acts of violence before they occur by identifying threatening trends and by tracking shifts in how people interact with one another online—all while protecting their civil liberties and privacy rights. This unique approach fully abides by social media’s rules of engagement. I.D.Eco has a zero-tolerance approach when it comes to profiling. It does not target individuals, but instead gains an understanding of the collective trends that may lead to an act of violence. Some believe that bolstering school security will deter violence, but this reactionary measure only addresses part of the problem. Instead, we must identify threats, mitigate risk and protect children and staff before an act of violence occurs. I.D.Eco gets to the root of the problem by enabling continuous monitoring of the social media landscape for threats before they result in violent acts and loss of life. It also significantly reduces the need for costly physical security protocols. Adolescence is a stressful time under the best of circumstances. When children’s concerns are heard and addressed, they are less inclined to act out in violent or self-destructive ways. But when their cries go unanswered, they seek belonging online where negative influences can so easily draw them in. The I.D.Eco solution interprets the messages of potentially dangerous influencers and identifies which hot-button topics increase tensions among students and cause violent behavior. The inherent anonymity of online interaction combined with the ‘no boundaries’ nature of social media communication increases students’ susceptibility to online radicalization, recruitment or intimidation. Understanding extremist language and ideology is key to targeting dangerous messaging and the groups who share similar viewpoints. I.D.Eco monitors the language propagated by hate groups, radical movements and local networks such as violent gangs, and identifies the subtle but insidious nuances that negatively affect the mental health and well being of the student body. This works two-fold, proactively identifying threats to student safety and empowering officials with information they need to intervene. As law makers and public safety officials continue to debate potential approaches to the ongoing crisis of school shootings, children and school staff remain vulnerable. I.D.Eco offers a new solution to this ongoing crisis, using the most powerful machine learning models to intercept threats on social media, deliver actionable insights, and ultimately prevent threatening behavior from becoming a violent act. We cannot afford to wait. The time for I.D.Eco is now.